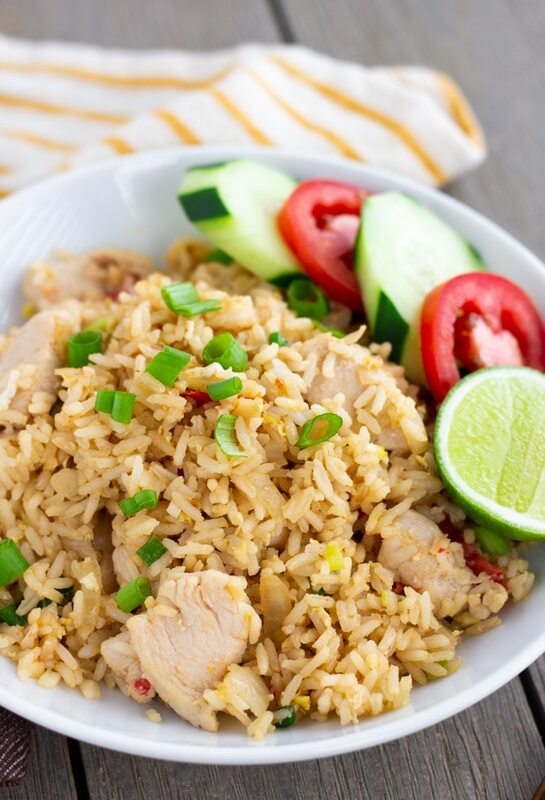 Thai fried rice is different from Chinese fried rice and instead has hints of citrus and umami. 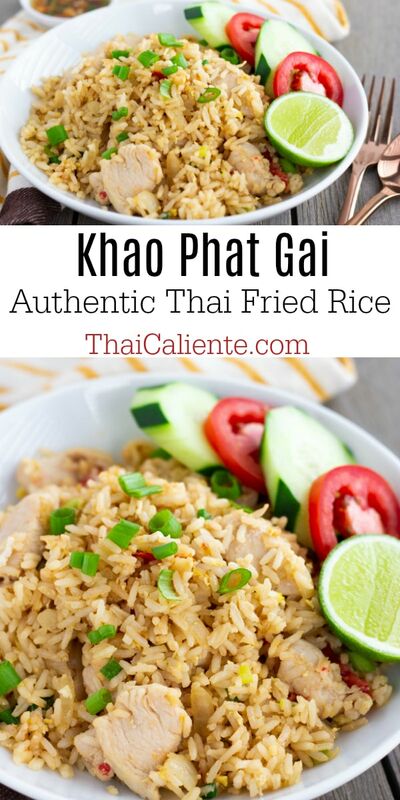 Khao Phat Gai, or Thai Fried Rice with Chicken, is one of those meals that truly brings me back to my childhood. 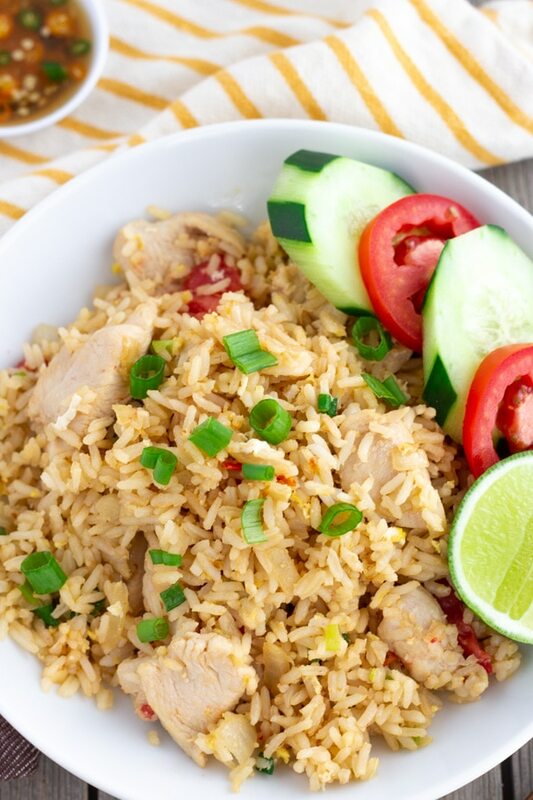 I loved eating fried rice as a kid, and it was one of those meals that my mom could make in a few minutes with leftover rice and whatever protein she had on hand. Sometimes it was just fried rice and eggs, but I still loved it! 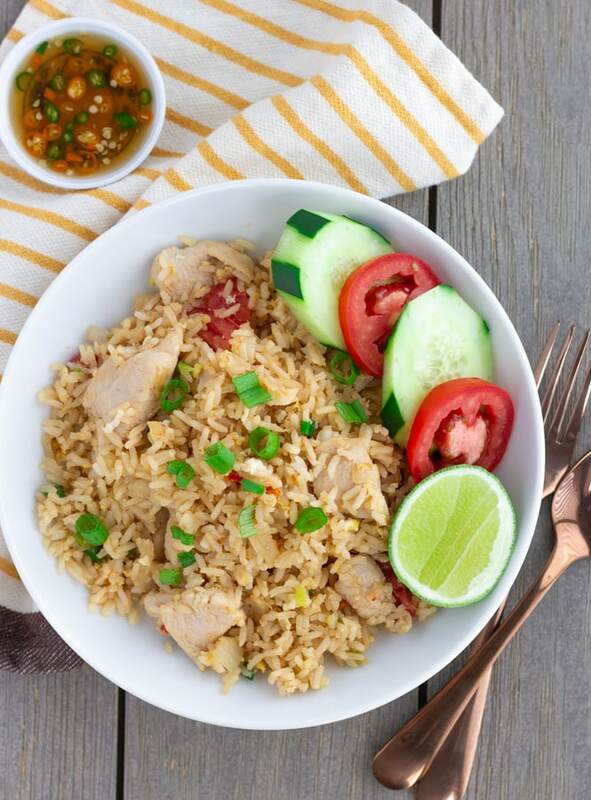 Thai fried rice is also tradtionally served with Prik Nam Pla, a sauce made of fish sauce, lime juice, and fresh Thai Chili’s. It may not sound that great, but it really brings out the authentic flavors of khao phat. Growing up with a Thai mom, we always had the rice cooker going with Jasmine rice. It’s pretty common in an Asian household. Now my mom knows that eating white rice everyday is not healthy, and surprisingly she doesn’t even own a rice cooker anymore. My dad eats a low carb diet and my mom rarely makes rice, and if she does it’s usually brown rice. I have a recipe for a healthier Cauliflower Thai fried Rice, that I make often, but I want to preserve some recipes from my childhood and document my mom’s recipe for Khao Phat. It’s all about balance 🙂 Thai Fried Rice is also something my mom would always make for gatherings and parties, in addition to her famous Thai Spring Rolls. My high school friends would love coming over if they new my mom was making Thai food. I love that I get to pass down these recipes to my kids and of course have new ones as well. This is really my passion and drive behind my blog. Creating and preserving family traditions and recipes for the next generations to come. What are some of your favorite family recipes? This page contains affiliate links. If you click on one of the product links and complete a purchase, I’ll receive a small commission. The price of the item does not increase with the affiliate link. Thank you for your support! Combine all ingredients for Prik Nam Pla and set aside in a small serving dish. Combine Soy sauce and Oyster sauce together and set aside in a small bowl. Prep all ingredients prior to starting. In a large pan or wok, heat 1 Tbsp of oil over medium high heat. Cook chicken until done. Remove and set aside, wipe wok clean with a paper towel. Add Rice, break up any chunks and toss around. Move rice over to one side of wok or pan, and place egg on the empty side. Scramble egg, then toss with rice. Add soy sauce mixture and toss. Lower heat, add sliced tomatoes, white pepper, and half of the green onions. Reserve the other half for garnish. Plate fried rice with sliced cucumbers, lime wedges, and Prik Nam Pla on the side. The kids love it when I make fried rice, so I will try this recipe next time. Have a fun fall break! I love Khao Phat. It’s so easy to cook too. I’ll have to try your version with the chicken ( I usually use crab). Thanks for stopping by Andrew! I love crab fried rice too, but I always have chicken on hand 🙂 Hope you enjoy it!